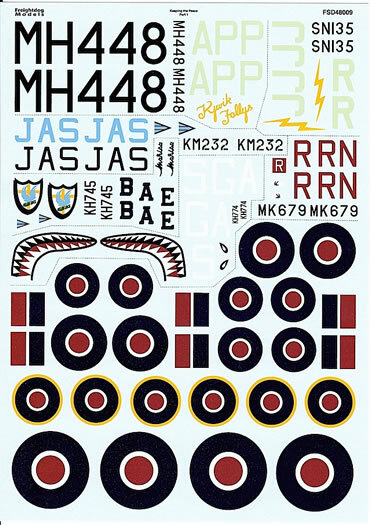 Highly recommended – Freightdog has delivered another decal sheet full of attractive options. 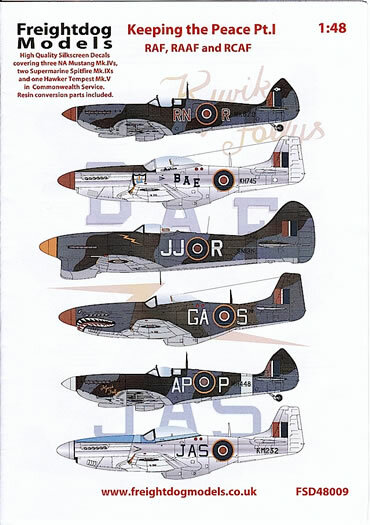 Freightdog Models’ postwar-Commonwealth theme continues with this decal set for six interesting Royal Air Force, Royal Australian Air Force and Royal Canadian Air Force machines, all of which saw service in Europe at or shortly after the end of World War II. Mustang Mk.IV, KH745/BAE, “Marisa” of Group Captain Brian A. Eaton of 3 Squadron, RAAF, Cervia, Italy, April 1945. This aircraft also featured in Freightdog’s 1/32 “Silver Merlins” decal set. It is finished in a combination of bare metal and aluminium lacquer, and features Eaton’s initials “BAE” in a staggered pattern on both sides of the fuselage under the cockpit. According to David Muir’s “Southern Cross Mustangs”, these initials and the name “Marisa” should be dark blue, drop shaded in black. This option is provided by Freightdog, but – acknowledging that period black-and-white photos of KH745 aren’t definitive in terms of colour – Freightdog also provides an additional decal sheet offering the codes and name in red and light blue for modelers who believe these might be better choices. The same options are provided for the Desert Air Force emblem that is carried on both sides of the fuselage forward of the cockpit. This decal looks a little better in 1/48 than it does in 1/32, but even in the smaller scale is probably a bit under-detailed. Mustang Mk.IV, KH774/GA-S of 112 Squadron, RAF, Cervia, Italy, April 1945. This machine is camouflaged in the US DuPont colours of ANA 613 Olive Drab and ANA 603 Sea Grey on the upper surfaces and ANA 602 Light Grey on the undersurfaces, set off by white codes, a red spinner and the famous 112 Squadron shark-mouth on the lower forward cowling. The camouflage is applied in the so-called “firewall scheme”, with a neat split between the Olive Drab and the Sea Grey along the firewall, and a symmetrical demarcation between the upper wing/upper fuselage colours. Spitfire Mk.IXc, MK679/RN-R of 72 Squadron, RAF, Zeltweg, Austria, November 1946. The combination of this aircraft’s standard European day colours of Dark Green and Ocean Grey over Medium Sea Grey with a red-and-white spinner and squadron codes makes for a nicely understated subject. This Mk.IXc was fitted with the later, pointed style of rudder. So was the next aircraft – Spitfire Mk.IXc, MH448/AP-P, “Kjevik Follies” of 130 Squadron, RAF, which was deployed to Norway as part of the Allied force supervising the surrender and disarmament of German troops in July/August 1945. This Spitfire also looks reasonably plain in its Dark Green/Ocean Grey/Medium Sea Grey camouflage and Sky codes and fuselage band, but again Freightdog has found something a little different, this time in the form of large post-war serials painted under each wing. Mustang Mk.IVa, KM232/JAS of Wing Commander J.A. Storrer, 443 ‘Caribou’ Squadron, RCAF, RAF Hunsdon, 9 May 1945. This natural metal/aluminium lacquer machine also featured on Xtradecal’s recent “Mustang Mk.IV in RAF, RCAF and RAAF Service” set, and carried Storrer’s personalized markings in non-standard roundel blue letters, highlighted by a lighter blue drop shadow. KM232 is an aircraft over which there remains some uncertainty over the colours of the anti-glare panel and canopy framing – Freightdog has interpreted these as three shades of blue, while Xtradecal believes they are a combination of two blues and olive drab. Whichever colours you choose to apply, you’ll end up with a very colourful model. Hawker Tempest Mk.V, SN135/JJ-R of 274 Squadron, RAF, Dedelstorf, Germany, July 1945. For those modelers who managed to get a copy of Eduard’s recent Tempest reissue, here’s an aircraft slightly different from the options provided in that boxing – Ocean Grey/Dark Green and Medium Sea Grey, with Sky codes and a yellow spinner and lightning flash on either side of the fuselage under the cockpit. The decals are typical Freightdog – crisply printed with neat colour demarcations and minimal carrier film. No airframe stencils are provided, but these should not be difficult to source. 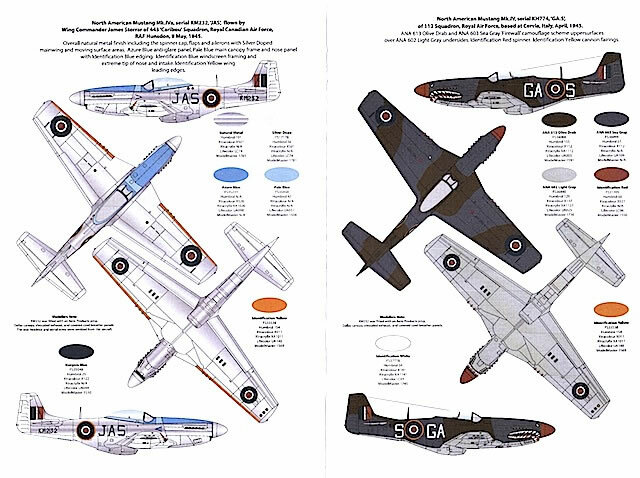 The instructions also look good, with four-view drawings of each aircraft, clear colour callouts and specific mention of distinguishing features such as canopy and propeller type. A nice additional touch is the provision of four resin carburretor intake louvres – enough for the modeler to complete the two Mustangs (KH774 and KM232) that were fitted with these features. This sheet looks like another winner from Freightdog, with its combination of interesting, well-researched subjects and high-quality decals and instructions, and bonus resin parts. The only problem I can see, and it’s not Freightdog’s fault, is the scarcity of the Eduard Tempest, and the lack of a really decent Spitfire IX in 1/48 – perhaps Tamiya can scale down their 1/32 kit! Thanks to Freightdog Models for the sample.